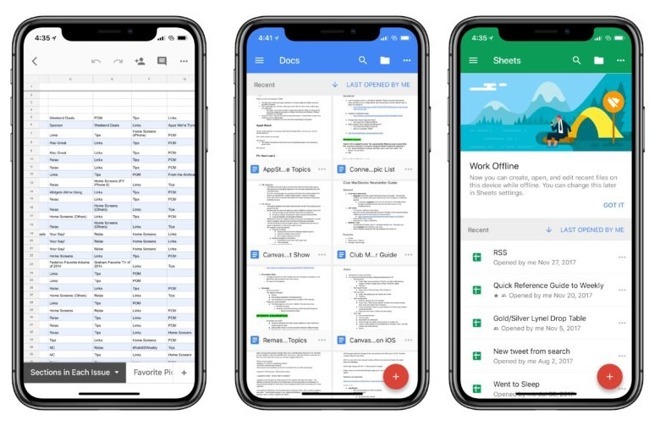 Google has released updates for its Docs, Sheets, and Slides apps for iOS, with the trio of productivity tools adding support for Apple's iPhone X and iOS 11, as well as the ability to use the drag and drop functionality introduced as part of iOS 11. The addition of support for the iPhone X now means the Google apps are optimized to use the larger and higher-resolution 5.8-inch display of Apple's flagship mobile device. The toolbars at the top of the app now take into account the TrueDepth camera "notch," with the color of the app's top bar carrying up to the sections displaying the time and status icons. Drag and drop, a new productivity function introduced in iOS 11, brings the Google apps in line with other productivity tools, and is especially useful on the iPad. It is now possible to drag content into the three Google apps, as well as away from the apps into others, making it easier to add elements to documents and slides when multitasking. All three of the Google apps updated today have the same major list of changes within the "What's New" section of their respective App Store listings. The accompanying text also mentions "bug fixes and performance improvements" to each app, but does not go into detail about what the changes are. While Docs and Slides both bear the version number 1.2017.46204, Google Sheets has the slightly higher version number of 1.2017.46206. Google Docs requires 211 megabytes of storage while Google Slides requires 257 megabytes and Google Sheets needs 336 megabytes. All are free to download from the App Store, and are compatible with all iOS devices running iOS 9.0 or later. The first Google app to notably include support for iOS 11's new features was Google Drive, which was updated in September to work with Apple's Files app. The update added Google Drive to Files' roster of cloud storage services the app could access, but was absent from the initial collection of compatible cloud storage providers.